Love Medicine, by Louise Erdrich, is a book of short stories, but looking at them as a novel shows that the book is much bigger than the sum of its parts. This is a group of very interconnected short stories that cover many decades in the lives of members of two interconnected and very extended families – the Kashpaws and the Lamartines. Each short story is a first-person perspective from one of the major characters and serves to show what made that individual who they are in the contemporary time of the novel (the 1980s). We see many events and scenes from the perspective of several different characters at different times. Much of what happens is about love – marriages beginning and failing, extramarital affairs, and youthful love abound. Love Medicine opens with the death of June who is both matriarch and outcast, and comes full circle at the end when we hear from Lipsha, a young man who was raised without ever knowing the story of his past. Each short story in Love Medicine stands alone, but it is their novelistic reflection of each other that makes the book worth reading. Different stories often depict the same events from new perspectives, or show a character earlier in their life to indicate how things got to be the way they were later on. Erdrich delves into the treatment of Native Americans in our country over the past few hundred years, but I do think she could have gone deeper. Some of the tragic events that various Kashpaws and Lamartines have faced have much deeper and messier causes than Erdrich describes. 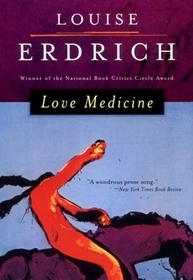 Where Erdrich truly succeeds in Love Medicine is in showing how upbringing and parentage (adoptive or otherwise) deeply influence the lives of children. Lipsha’s story at the end of the book is fantastic. It stands alone, of course, and it’s also a culmination that brings everything together. Lipsha is both a Kashpaw and a Lamartine, and his story offers a road forward for the families.